Odisha is known for its rich cultural heritage, language, dance forms, traditions, and, so is its Odia culture. 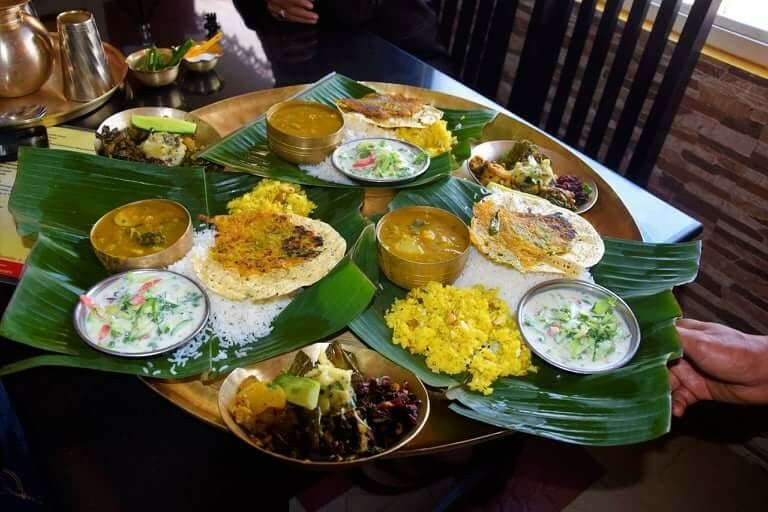 Odisha as a state has been invaded by outside kingdoms, yet has defined its own individuality in terms of art & architecture, cultural identity and of course, its unique cuisines. 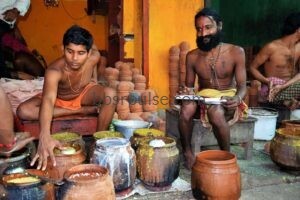 Odia music as a part of art form, have always shown food as an indispensable part of its culture. 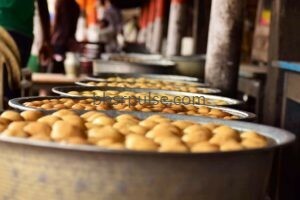 The culinary heritage of Odisha can be best described from Puri Temple’s Abhada (Mahaprasad), Pakhala (fermented rice), Sweetmeat to Pithas (pancakes) etc and the numerous songs dedicated to it. 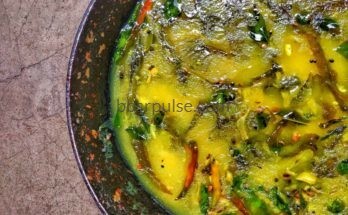 An attempt has been made here to share some of the the popular Odia songs best describing Odisha’s diverse food culture with Pakhala leading the way. 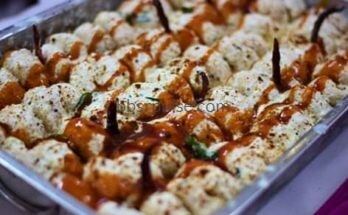 The list are enormous, but here some of the most popular songs have been mentioned here – some fully focused on food and the celebration of consuming it while others have food as theme starting from bhajans, folk songs, Odia film songs, non-film and some new gen parodies and YouTube songs. I have tried to write the lyrics of three most popular Odia songs (as per my opinion) in English transliteration for better understanding of Non-Odias viewers. 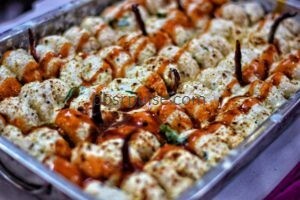 This song is considered as the most popular song in this food genre. Have seen it being played at marriage receptions during the gramophone record era. Its featured in Odia movie Akhi Trutiya (1980) and picturised on comedian Shyamalendu & Namrata Das, beautifully rendered in his trademark style by Tansen Singh with lyrics by Baikuntha Nath Mohanty and music by Rakhal Mohanty. The song takes us on a foodie journey to various places in Odisha & the popular food associated with it. Yet , some feel that certain items & places have not been featured here like Pahala Rasagola & Nimapara Chhenajhili. The reason is that very few know that this iconic song has been inspired from another rare song of 1930s wehereas Pahala Rasagola and its market came up only in 1950s, Still the lyricist could have added Pahala Rasagola name in the version song while customising the contents as per current trends. Btw, what other popular Odia dishes did you find missing in the song ! This is the original song I was talking about from which the filmi version was adapted by lyricist Baikuntha Nath Mohanty – Asa Kie Khaiba Ho ! The song rendered by Gokul Mohanty in the prevailing South Odishan style, features the popular Odia food and the places associated with it in Odisha at that period. I feel this type of songs can be used for promoting food tourism and thereby Odisha tourism. This evergreen song written by Kavichandra Kalicharan Pattnaik in the voice of Pandit Balakrushna Dash, celebrates the most common food of Odias, Pakhala. In this song, the writer is addressing his ladylove as Pakhala Kansa – the bell metal bowl of rice with water, in short the bowl of happiness. Kalicharan best known for his classical lyrics captured the emotions of Odias with Pakhala, well with his hatke creation. Pakhala is the summer thirst quencher consumed in Odisha for centuries& has is also offered to Lord Jagannath under Chappan Bhog. The very word Pakhaḷa has been used in the Odia poems of Arjuna Das in his literary work Kaḷpalata (1520-1530 AD). This is about another traditional Odia food, Chuda Chakata (flattened rice mix), again, in the voice of Pandit Balakrushna Dash. 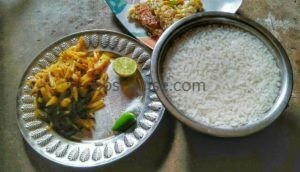 Odisha ha sits own unique way of Chuda (Poha) preparation & eating, with diff mix resulting in various tastes & flavours. 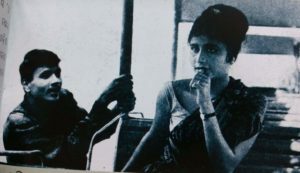 Common mix for taste mentioned in the song includes kadali, ambula, lembu, amba, guda, luna lanka, ghia, suji khiri, amruta, rae, ukhuda, amba sadha etc. And even the song celebrates the way people seats cross legged (chaka pari basitha) to savour the common man’s tiffin. 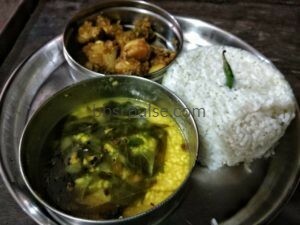 Kanji is a typical Odia tangy dish made from torani (water taken from Pakhala) or peja (rice gruel) and cooked with vegetables or green leafy vegetables. Its said that this song’s popularity by Akshay Mohanty (lyrics-traditional) made Kanji more popular across Odisha. The song describes about kanji’s popularity with all castes of Odisha & mentions satirically how its treated differently by various communities, be it Nayak, Kamara, Bhandari, Gouda, Karana or Brahmana. 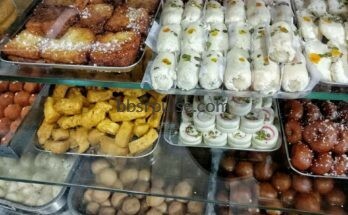 Which one to choose – sweetmeat, drink, pitha or muan ! Pt Balakrushna Dash comes with yet another food song with “Mudhi Nadia” which talks about the celebration of eating mudhi (puffed rice) in typical Odia and the ingredients added to it for better taste & flavour. Though not as popular as the pakhala song, this one explicitly makes a claim: that only an Odia recognizes the pleasure of eating Mudhi with Nadia (coconut) slices and then goes on to describe the right setting and the preparation to maximize the pleasure. 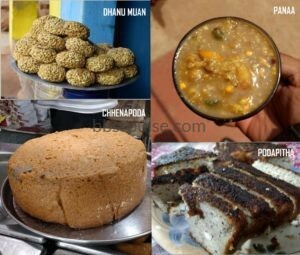 Anyone from Baripada in the viewer’s list must be proud of Mudhi & will be thinking why Mudhi Mansha (puffed rice with mutton curry) is not featured in this article ! Its featured in Odia movie Stree (1969) & picturised on Swaroop Nayak with debutant Kuldeep Kaur (Sujata Anand), music by Bhubaneswar Mishra & sung by Akshay Mohanty. Actor Swaroop Nayak debuted was lyricist with this song in which food lines seems to be inspired from the original “Asa Kiese Jiba” by Gokul Mohanty where as the rest song has been created from a single liner – “Dhina dhin tak dhina dhin, Mun toh Hero tu mo Heroine”. This is a lesser known bhajan rendered in soulful voice by Bhikari Bal, but matching with the food theme. The song & the voice will be enough to prove why Bhikari Bal is referred as Bhajan Samrat (King of devotional songs). The lyrics talks about how Jagannath’s Mahaprasad (sacred temple food) has made his devotees crave for it& rush to Sri Kshetra Puri to have it. 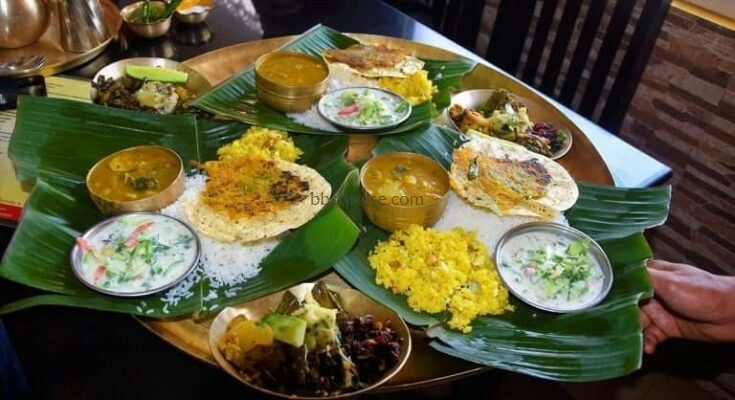 Like Rasagola Dibasa (Niladri Bije day in June-July) and Pakhala Dibasa (March 20th), there needs to be campaign on a big scale for an Odia Food Day or Odia Festival Day too with focus on traditional & lesser know Odia foods. And, if promoted well through social media, it can turn out to be a day of celebration of varieties of Odia food for the other states in India to know & acknowledge its diversity. Khiramohana – typical Odia term for Rosagola. Pahala & Salepur are now associated with it. Manda, kakara, chakuli, arisa, baneichi ae nana ho ..
Asa kiye khaiba ho, ama raja babu ra khana ! Dhenkanal ra biri bara, khaiba thare bhai..bujhila ti ! Manda , akaara , chakuli, arisa, baneichi ae nana ho ..
Asa kiye khaiba ho, ama raja babu ra khana..ha ! ha ! ha ! ASA KIYE SE JIBA RE ! Asa kiye se jiba re, aaji raja ghara khana (2)..aaha thhey ! Odisha has strong folk songs & palli geetas (village songs), but those either have not been documented properly & have been lost in time. 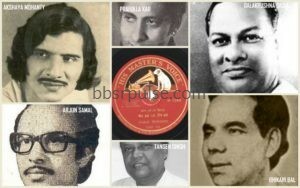 Sadly many of the popular songs are yet to be available in Google or YouTube. Festive and brata (puja) songs have plenty of instances of food items mentioned in it which are integral part of the lyrics incl Laxmi Purana, Khudurukuni Puja & Sudasa Brata, Even Nanabaya Geeta (lullaby songs) & Odia school rhymes can be checked out for its food contents. The list is not comprehensive, hence readers are requested to share their inputs and knowledge to enhance the contents. Happy Eating & Singing !! Beautiful narration with excellent look and feel.